In the renaissance of South American cinema during the last 15 years, the road movie has been embraced by numerous film-makers: think Walter Salles’ Central Station, The Motorcycle Diaries and the forthcoming Jack Kerouac adaptation On the Road; Alfonso Cuaron’s Y Tu Mama Tambien; Pablo Trapero’s Familia Rodante; and Carlos Sorin’s Bombon: El Perro. Perhaps this trend reflects the vast geography of the continent itself, yet Salles himself has also observed that ‘road movies are not about what can be verbalised, but about what can be felt’, making them ideally suited to the big-screen treatment. The fiction debut feature of Argentinean documentarian Pablo Giorgelli, Las Acacias is a slow-burning, minimalist twist on the genre. A taciturn, middle-aged truck driver Ruben (German de Silva), who is transporting a load of timber from Asuncion in Paraguay to Buenos Aires, reluctantly gives a lift to a younger indigenous woman Jacinata (Hebe Duarte) and her 5-month-old daughter Anahi (Nayra Calle Mamani). She is heading to the Argentinean capital to stay with her cousin and look for work. Shot in long takes and almost exclusively from within the confines of Ruben’s lorry, the low-key Las Acacias is sparing in terms of dialogue, dramatic action and music. Nor on this evidence is Giorgelli an artist who believes in presenting the audience with detailed back-stories. 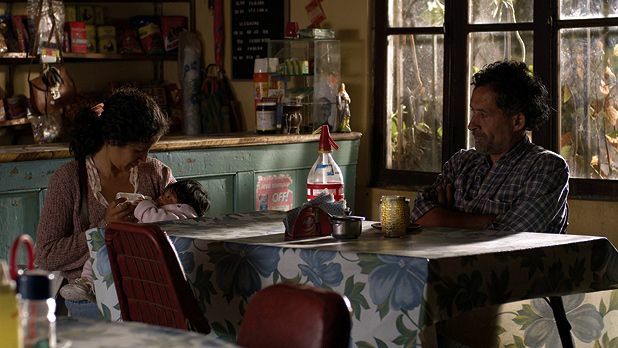 We learn that Ruben hasn’t spoken to his son for 8 years, and that the father of Jacinta’s child has disappeared. At various truck stops we’re made aware of the social and economic realities and injustices that shape these individuals’ lives. Thanks however to the beautifully naturalistic performances and Giorgelli’s sensitive direction, there’s something quietly moving about the bond that gradually develops between the characters. It’s proof of how, cinematically speaking, less can certainly be more. Selected release from Fri 2 Dec.
Minimalist Argentinean road movie about a middle-aged truck driver (da Silva) who gives a lift to a young indigenous woman (Duarte) and her baby daughter, and the bond that slowly develops between them. Beautifully naturalistic performances and Giorgelli's sensitive direction prove that less can certainly be more.